Retina display is a term coined by Apple that just means that the pixel density on a screen is so high that the naked human eye cannot distinguish individual pixels at a normal viewing distance. It allows the screen to show more detail and improves the viewing experience. Because the viewing distance is different for each device (you hold a phone closer to your face than you would a tablet), the number of pixels per inch (PPI) used to achieve Retina quality is different. Don’t worry if you don’t have an Apple device – only the term is coined by them! What are the benefits of Retina display? 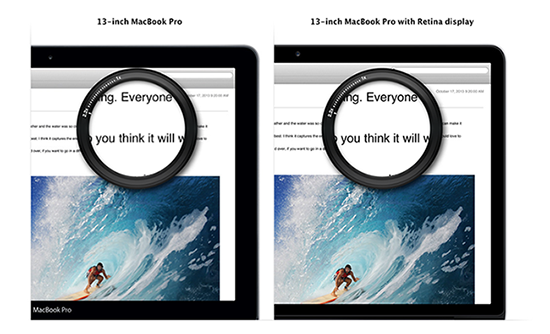 You’re probably wondering if a device with Retina display really makes a difference. With today’s technology, it’s tough to get a ‘bad’ device. If you’re using a device that doesn’t use a Retina display, you probably think the quality is crisp and sharp. But once you see a screen with Retina quality, you realize just how much clearer and brighter the screen is, especially on fine detail. It’s like when you get a television with HD and then you see a television that doesn’t use it – the picture just isn’t as crisp and clear as it could be. The Retina display reduces unwanted glare while maintaining color and quality. Its high contrast ratio results in blacker blacks and whiter whites. If you remember our Illustrator and InDesign blog, we touched upon how images on screens get pixelated when a zoom function is used – a similar thing happens when you zoom on a non-Retina display screen. Keep in mind that while this all sounds like a good idea, it depends on how good your eyesight is and how far away you view your device. Does Retina display make a difference in how my device runs? Sort of. In order for a device to handle a Retina display, it needs a stronger battery. The batteries are larger than devices that do not use Retina display, however the usage hours remains the same or maybe even less due to the power consumption of Retina. Think of it like a vehicle – the bigger the car, the more likely it is to have poor gas mileage. Also, because the apps that use a Retina display are technically bigger, they use up more space in the memory. Because different hardware is used, you won’t notice a difference in how it runs. So it’s really up to you whether you decide to purchase a device that uses Retina display. They can pack a pretty penny so it’s an area where you could save a few dollars if you’re not super into technology. We’d love to hear your thoughts and opinion on this!